0 Comments Published November 14th, 2010	in Misc. After several weeks of flirting with the half-way mark and just peeking above it for a single week, the retail investors surveyed by the AAII finally went all in. This week’s bullish camp jumped sharply to 57.6%. That is the highest since mid-January 2007. But while that is garnering all of the attention for most people, I prefer to look at the relative number of bulls compared to bears. And since those who are pessimistic about the stock market’s performance remained relatively stable at 28.5% the bull ratio is actually lower than it was two weeks ago. So rather than showing the bull ratio, which I normally do, I thought we’d take a look at the 4 week moving average (if you’d like to see the bull ratio you can always click on the previous link). As you can see from the chart, usually optimism is muted within a bear market. So the highs within the 2008 bear market are not as lofty as the ones preceding it. The biggest bout of optimism was in May 2008, the last gasp of the bulls before the unrelenting waterfall declines that proved so devastating. There is no question though that retail investors are in an extremely bullish mood and they have been sustaining this level of enthusiasm for several weeks. Stock market newsletter editors have also become increasingly bullish this week with 48.4% identified as such by the weekly Investors Intelligence survey conducted by ChartCraft. That is the highest number since the first week of May 2010 when it spiked to 56%. The bears declined to just 23.1% this week. 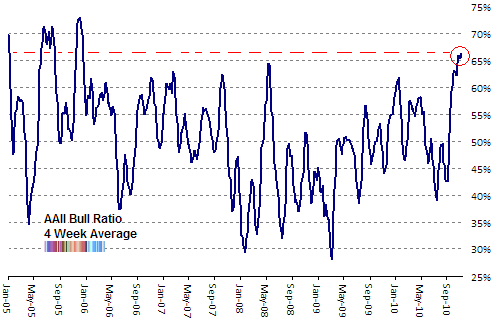 As with the AAII survey, while the bulls have increased to an extreme level, the bears have not retreated with the same intensity. So the bull/bear ratio for this survey stands almost unchanged at 2.1:1.0. By now you have plenty of reason to congratulate yourself for having boarded the gold bandwagon. The early tickets are the cheap ones, and you’ve already had quite a ride. The best of the ride, I believe, is yet to come, and it should be very good indeed. It should be so much fun that your wallet may start to feel a bit giddy – which can be dangerous. So it would be wise to consider, now, how things will be and how they will feel when the current bull market in gold reaches its “end of days.” Because it will end. Buying at the right time is the key to building profits. Selling at the right time is the key to collecting them.. In 1980, gold briefly touched the then record price of $850 per ounce. In terms of purchasing power, that would be $2,400 in today’s dollars. And for the value of the world’s entire gold stockpile to attain the same share of the world’s total wealth that it represented at the 1980 peak, the price would need to reach $5,800 per ounce. But so what? Before you can look to those numbers for guidance about what the peak in gold’s bull market will look like, you need to consider how the process that drove the earlier bull market compares with what is happening today. The earlier bull market was driven by price inflation in the world’s reserve currency, the dollar, that reached an annual rate of 14%. The more expensive it became to use dollars as a store of value (i.e., the more rapidly the dollar’s purchasing power was declining), the more attractive gold became as an alternative way to store value. Rapid expansion in the U.S. monetary base through the Federal Reserve’s asset purchases. Most of that expansion has yet to be reflected in a growth in the U.S. money supply. It is still sitting, like a charge in a capacitor, waiting for something to set it off. There was no similar liquidity bomb stored in the U.S. economy’s closet during the years leading up to 1980. Unprecedented growth in federal government debt, which adds to the political attractiveness of price inflation. There were federal deficits during the 1970s, but nothing like today’s – just enough to give the party out of power at any time something to talk about. The accumulation of U.S. Treasury debt and privately issued dollar debt in the hands of foreign investors. U.S. debt to foreigners wasn’t a factor in the years leading up to gold’s 1980 peak. This time around, it could be a powerful force for accelerating inflation. Even moderate inflation could spook foreign investors. Their sales of Treasuries and other dollar-denominated IOUs would push down the foreign exchange value of the dollar, which would raise the cost of imports coming into the U.S., which would further stimulate price inflation. A nasty feedback. And foreign holdings of U.S. debt operate as a second vector feeding the political attractiveness of dollar price inflation. Depreciation of the dollar can be framed as a clever way to shortchange foreign creditors. “It hurts THEM, not US” would be the slogan. All those factors are working to make price inflation distinctly more severe than it was in the 1970s, which argues for a higher peak price for gold. When the metal does surpass its 1980 peak in purchasing power, the event is likely to be widely reported in the press. I suggest that you not attach any significance to the event. It won’t be time to sell. Gold and gold-related financial products will be commonplace. Even today, most financial institutions still hold the “barbarous relic” attitude toward gold. Yes, you can get GLD through any stockbroker, but with a few exceptions, the brokerage firm’s heart isn’t in it. They offer GLD for the same reason even the best seafood restaurants have a steak on the menu – they know someone will ask for one, even though that’s not what they are in business to serve. Before the bull market is over, that attitude will change. Mainline brokerage firms won’t just have gold-related products available, they will advertise them. They will boast about them. They’ll claim to specialize in them. And it won’t be just the brokers. Your local bank will offer gold-related CDs. Your insurance company may be offering life insurance denominated in ounces. Gold going mainstream won’t mean that the bull market is over, but it will be a sign that it’s getting long in the tooth. An early warning signal. You’ll be hearing gold chatter wherever people talk about investing. The inhabitants of Financial News TV Land will be talking about gold approvingly, and each of them will be trying to suggest he was early in recognizing the gold bull market. You won’t be able to get through a golf game or a cocktail party without someone talking about gold. Even your brother-in-law will want to explain it to you. The gold standard will become respectable. Today advocates of the gold standard are seen as standing to the good side of whacko, but not by a big margin. But as gold attracts more converts in the investment world, the politicians will want to associate themselves with it by proposing some brand or other of gold convertibility for the dollar. Respectability for the gold standard will be a sign that a majority of the people who are going to buy gold already have. Other things will look cheap to you. When gold nears its peak, even if you suspect that that’s what’s happening, you won’t feel certain about it. But when you start seeing investments – probably conventional stocks – that look like strong bargains, treat those sightings as a sign it’s time to start selling gold. You know the reasons that led you to buy gold. If you are tempted to sell part of your holdings to buy something whose low price seems to give it better prospects, then you probably will be selling at the right time. You could be selling to the last new buyer. With gold now over $1,400 an ounce, where do we go from here? To stay updated on the gold bull market and the strongest gold stocks… and find out how high gold might go… and be alerted when it’s time to sell and collect your profits… check out BIG GOLD – Casey’s monthly advisory on all things precious metals and large-cap gold stocks. At only $79 per year, it’s by far the best investment you can make. Click here for a risk-free 3-month trial with money-back guarantee. NDR has been very bullish for some time now. They actually went maximum overweight equities in early April, just ahead of the intermediate market top. And they remained with that thesis throughout the summer: NDR Continuing Bullish. Valuation also remains relatively low. But the market is obviously overbought at the moment. So NDR wouldn’t be surprised by a short term correction within a continuing bull market. I’m always comforted when my own views coincide with those of NDR and other technical minded luminaries like Lowry, Leuthold, etc. For the moment I’ll take the solace that it offers. Richard Russell is not only the preeminent expert on Dow Theory, he is one of the most prolific newsletter writers (Dow Theory Letters) and thanks to his epic longevity, will hopefully go one to break records for many years to come. The “Oracle of the Dow” is not omniscient, unfortunately. Otherwise, we mere mortals would simply follow his sage advice to riches. But he continues to be an unabashed gold bull. This is the one market he has been pounding the table about for quite a long time and he has been absolutely correct. To my chagrin, it took me far far too long to realize that gold is indeed in a secular gold bull market. And of course, the next thought after that is the dread that it will be soon over. You are currently browsing the Trader’s Narrative weblog archives.